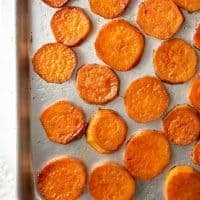 Easy Roasted Sweet Potatoes – made 2 ways! A simple side that everyone always loves. The perfect accompaniment for so many meals! Roasted sweet potatoes are a staple at our house! We can’t get enough of them as a side for so many meals. 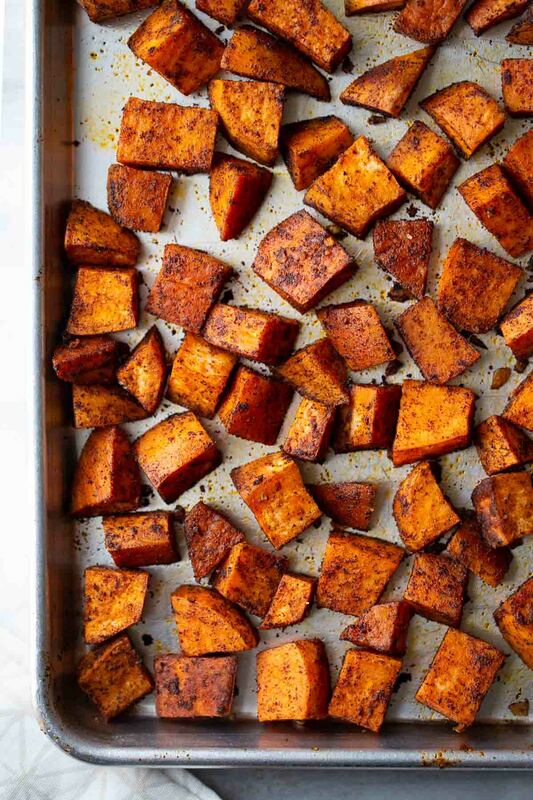 Over the years I’ve narrowed down my 2 favorite ways to make sweet potatoes – Cinnamon Coconut Sugar Sweet Potatoes and Chili-Cumin Sweet Potatoes. Sweet potatoes always taste delicious with just a touch of sweetness and cinnamon. Their naturally sweet flavor also pairs amazingly well with a little bit of spice! When picking out sweet potatoes I like to select the variety that is orange on the inside. These are often called jewel or garnet sweet potatoes or yams. 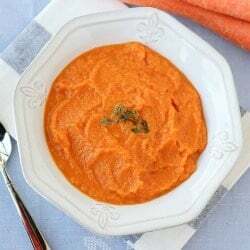 Sometimes grocery stores label the long, red-skinned sweet potatoes as yams – but they are actually just one of the many kinds of sweet potatoes. Look for sweet potatoes that feel firm and have unwrinkled flesh. The method for making both of these sweet potatoes is the same. You peel and chop the sweet potatoes into the desired shape, then toss with some kind of fat, spices and salt and roast at 400F for about 30 minutes. Be sure to chop the sweet potatoes in roughly the same size so they bake evenly. I love cutting sweet potatoes into medallion shapes when I’m making Cinnamon Coconut Sugar Sweet Potatoes. They are known as “magic sweet potatoes” at our house. Something about the medallion shape makes them magically extra delicious. 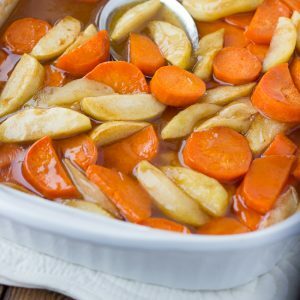 These sweet potatoes are delicious alongside turkey, chicken, Thanksgiving dinner or even if you just want a healthy sweet treat. 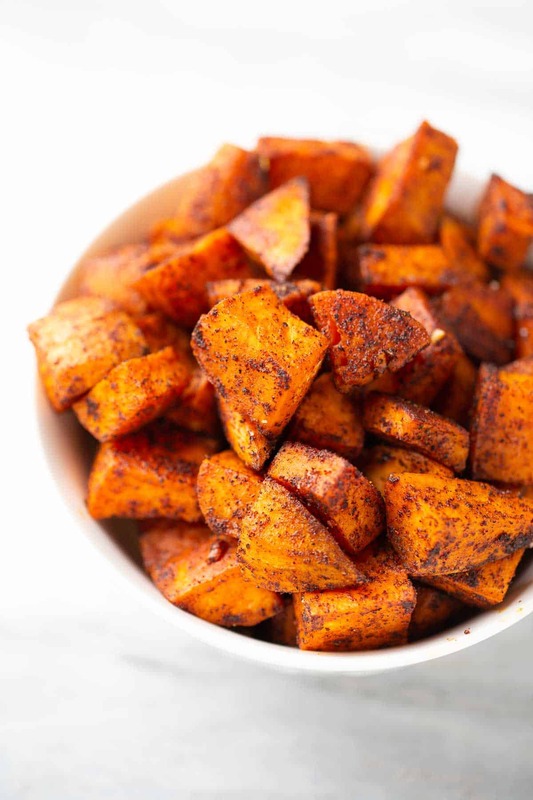 And if you’ve never tried pairing savory spices with sweet potatoes you must! The Chili Cumin Sweet Potatoes have such a delicious smoky, garlicky flavor. These sweet potatoes are delicious with bacon and a fried egg for breakfast, alongside salmon, or in meal-prep lunch bowls. I like using silplat liners on my baking sheets when I make roasted vegetables. Look for sweet potatoes that feel firm and have unwrinkled flesh. Chop the sweet potatoes in roughly the same size so they bake evenly. Toss with some kind of fat, salt and spices. Bake on a silplat liner or high-quality baking sheet. Enjoy with so many different meals! Peel the sweet potatoes and cut the sweet potatoes into the desired shape. Place the slices in a mound on a baking baking sheet, pour over remaining ingredients then mix every thing together with your hands to evenly coat the slices. Spread the sweet potatoes into an even, single layer. 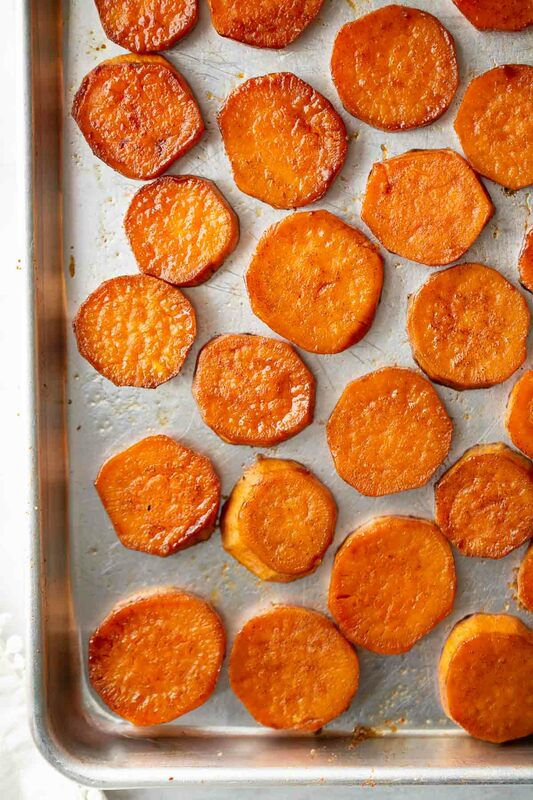 Bake for 30-35 minutes, until the sweet potatoes are fork tender. Enjoy! These have become a new staple in our kitchen. Thanks for the recipe! They came out better than any other time I have tried something like this; thanks a bunch! – celery salt, onion powder, garlic powder, paprika, pepper and salt; mixed in a small saucer of olive oil; coat medallions in oil & herb/spice combo. – cinnamon and nutmeg and brown sugar; mixed in a small saucer of olive oil; coat medallions in sugar & spice combo. Great to know! Thanks Miriam! I bet these would taste good without the added sugar – if I can get my kids to stop eating them before I cook them! I made them with only the coconut oil and cinnamon, and they came out great. I did use more oil, though. Also, I’ve made them as tall as 1.5 inches with longer baking time — endless variations to this great recipe! These are so delicious! I’m saying magic is the perfect description. I’ve made these a few times now and they turn our great. I’ll have to try the chili-cumin kind next. Thanks for a good easy recipe! 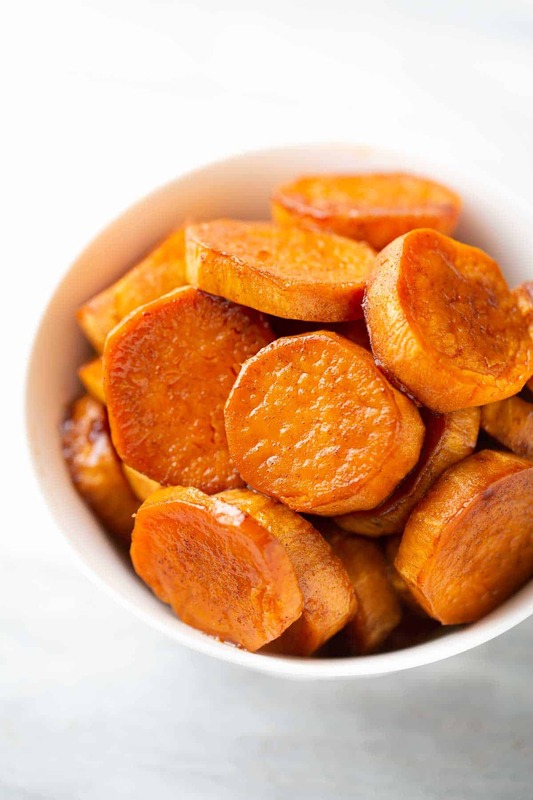 We are detox’ing and were looking for something different to do with Sweet Potatoes…. the Chili-Cumin ones hit the spot (currently can’t have sugar, and will try when we are done). My wife said this will be a requested item regardless of diet/detox. The combination of the chili/cumin with sweet potato resulted in a great flavor. I normally don’t comment but this was soo good that I had to. Great job putting it together and sharing!